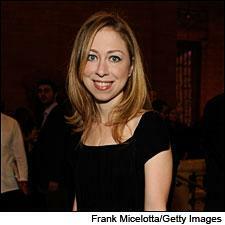 Details about the Mezvinsky-Clinton wedding are scarce, but we do know one wedding gift guests will enjoy. • It helps to be named Clinton, as in Bill, Hillary and Chelsea. It also helps to be named Clinton Vineyards in Clinton Corners, N.Y., sited almost within cork-popping distance of New York’s wedding of the century this weekend. The fortuitously named local wine was an obvious choice to be uncorked at the first Clinton inaugural dinner in 1993 and now, 17 years later, it will play a part in the festivities surrounding the wedding of Chelsea Clinton and Marc Mezvinsky Saturday. Wedding guests staying at inns and hotels in the region will find a bottle of Clinton Vineyards Tribute, a Seyval Blanc, in their rooms. There’s been no word yet on any further participation in the event by the local producer. If the local vineyard contributes a dessert wine for the reception, it could be any of a trio of fruit wines—Embrace, Romance or Desire—all appropriately named for a wedding gift. Although she would not comment officially on the presence of her wines at the wedding, Phyllis Feder, proprietor of Clinton Vineyards and a major player in Democratic party circles, observed that “Clinton Vineyards has had a long and warm friendship with the Clintons, dating back to when our wines were served at the Democratic National Convention in New York in 1992, the subsequent serving of a Victory White honoring Clinton’s elections and, most recently, a Victory White for the Obama celebrations. We are honored to be part of the wedding celebration and we rejoice in our longtime affection for the Clinton family,” she said. • Guests of the Mezvinsky-Clinton wedding (as well as the rest of us who didn’t get an invite) can also now head a little further north to New York's Finger Lakes and enjoy one of its more popular wineries from a spacious new tasting room. Dr. Konstantin Frank's Vinifera Wine Cellars, the historic winery above Keuka Lake, held a party Sunday to celebrate the opening of a new auxiliary tasting space. The previous room, along with its deck overlooking the sloping vineyards and the lake, was destroyed in an electrical fire in April 2009. While the small, original tasting room and the winery itself were undamaged, the fire left the winery crammed during high season, forcing them to erect a large tent. Trying to make the best of a bad situation, owner Fred Frank asked all employees for input on how to improve the new space. "We added bigger windows, offering great panoramic views," he says. They also put in noise-absorbing ceiling tiles, a better air-conditioning system and attached bathrooms—something no good tasting room should be without. • South Africa has lost a giant in industry and wine. Graham Beck passed away Tuesday after a long battle with lung cancer. He was 80. Beck made his fortune in coal mining, but his passions were horse racing and wine. In 1983, he bought a farm in Robertson and established a sparkling wine facility. He would later buy wineries in Franschhoek and Stellenbosch, and in 2005 bought Steenberg Vineyards in Constantia. Beck also owned horse farms in both South Africa and Kentucky, and was well known for his large personality and philanthropy. Violinist Joshua Bell takes a break from the stage for a glass of wine and a chat with party host Beth Nickel. • Earlier this month, about 800 partygoers raised their wineglasses and kicked up their heels at Far Niente’s Oakville estate to celebrate the winery’s 125th anniversary. Providing the music was Grammy-winning violinist (and huge Far Niente fan, based on his comments between numbers) Joshua Bell, pianist Jean-Yves Thibaudet and Grammy-winning jazz trumpeter Christ Botti and his band. A contortion act from Las Vegas Bellagio’s “O” by Cirque du Soliel also entertained. Oklahoma natives Beth Nickel and her late husband Gil purchased the winery—which was originally built in 1885—in 1979, debuting the Far Niente label with the 1982 vintage. The party featured plenty of these wines, with plenty of 3-, 6- and 9-liter bottles of older vintages, including the 1985 and 1991 Chardonnay and 11 different vintages of Cabernet between 1982 and 2005. Food was provided by 15 of Napa’s best restaurants, including Auberge du Soleil, Bistro Don Giovanni, Bottega, Bouchon, Cole’s Chop House, Mustards and Tra Vigne. Unfiltered spotted several vintners in attendance as we sipped on chilled glasses of Dolce, including Diamond Creek Vineyard’s Boots Brounstein, Cliff Lede and Margrit Mondavi. We’re already clearing our calendar for the 150th anniversary party. • The case of the extortionist of DRC has taken a grim turn. Prison officials in Dijon report that the man accused of threatening to poison vines at Romanée-Conti and Musigny was found dead in his cell this past Friday. The evidence suggests he hung himself, according to a local newspaper. The man was arrested in February after sending packages to both Domaine de la Romanée-Conti and Domaine Comte Georges de Vogüé containing maps of the vineyards and threatening to poison the vines if he was not paid 1 million euro by DRC and several hundred thousand euro by Georges de Vogüé. Both estates contacted the police, who had DRC co-director Aubert de Villaine set up a fake ransom drop in a cemetery in Chambolle-Musigny. There the suspect was arrested, along with his son. The arrested man was a former vineyard worker from Marne, who had studied viticulture at the Lycée Viticole de Beaune and worked in vineyards. He had also recently served a 12-year sentence for robbery. His son still faces trial this fall in Dijon.